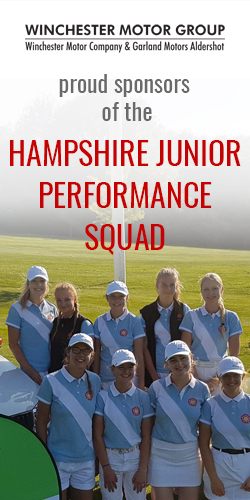 Liphook Golf Course was looking stunning as players and supporters arrived bright and early, full of excitement and optimism about the day ahead. The weather was slightly overcast but the forecast was for a dry warm day and so it turned out to be. As with the quarter final matches, both semi finals turned out to be tight affairs. Tammy Andrews and Jane Bennett (Corhampton & Lee-on-the-Solent) struck the first blows for their respective teams but Ailsa Fraser and Karen Gunther (Army & Weybrook Park) soon levelled things up. This set the trend for the morning and with the score line 3 – 3 in both matches the final and deciding pairs were coming down the 18th. 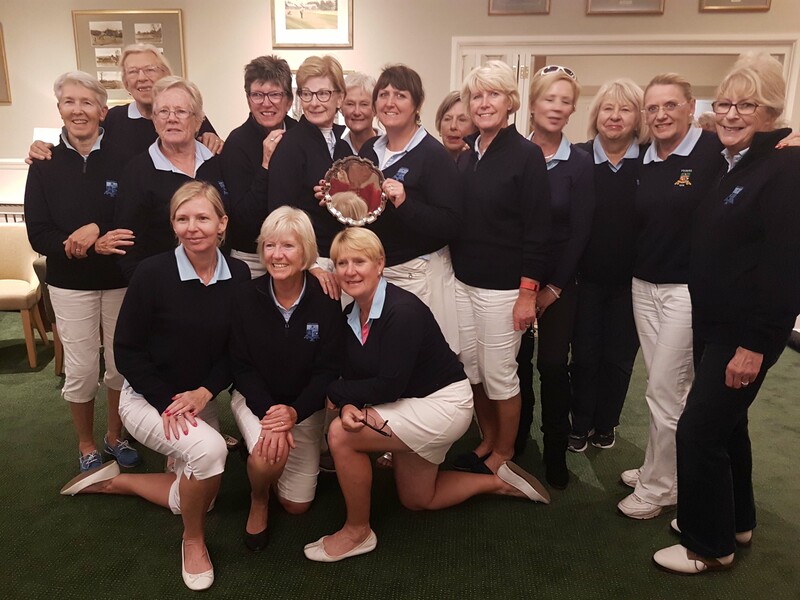 Jackie Wright (Lee-on-the-Solent) was 1 up in her match against Jan Dewey (Weybrook Park) and managed to see the match out and take her team through to the final. The other semi final decider was even tighter with Wendy Collens (Army) and Mary Mottram (Corhampton) all square as they approached the 18th green. It was Wendy who was to come out on top setting up an afternoon final between Army and Lee-on-the-Solent. With the morning matches going the full distance the start time for the final was pushed back 15 minutes to allow players to eat, drink and re-charge the batteries. The front match between Jane Bennett (Lee-on-the-Solent) and Ailsa Fraser (Army) was a tight affair and they turned all square. Ailsa then quickly went 2 up, a position from which Jane was never able to fully recover and first point on the board went to Army. Behind them Eilean Cunningham and Helen Sleightholme (Army) were dominating their respective matches and very soon Army were 3 -0 up. Job done? Most definitely not as the Lee-on-the-Solent tail was starting to wag. Ruth Donnelly pulled one back to make the score 3 – 1 then Anne Chambers won the 18th in her match against Linda Adlington to take matters down the 19th. We heard that Jackie Wright and Wendy Collens were all square in the final match and Anne and Linda were on their way down the 20th as the light started to fade. Next up were Carol Fletcher and Anne Green coming down the 18th with Anne (Army) 1 up. 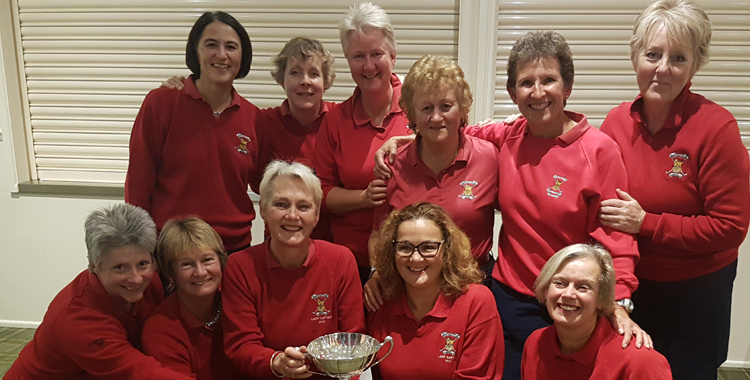 Despite a great effort by Carol the final hole was halved in par – cue Army celebrations who were to be crowned 2017 Stoneham Cup winners, the first time they’d won the trophy since 1978. Lee-on-the-Solent had battled hard and were worthy runners up. Our thanks must go to Liphook Golf Club for allowing us to use their magnificent course for our 2017 finals day. We were all made to feel most welcome by John Douglass, Club Secretary, and all his staff and particular thanks go to Ladies Captain Mary Boyle, her Vice Captain Kathryn Todd plus the lady members who provided such great support on the day. Finally, thanks go to Di Stock and her team of referees who, as always, did a brilliant job.